I bought a Black & Decker DustBuster a couple years ago because my wife and I have two dogs and we wanted a convenient way to spot-clean any dog hairs we found. I figure it would also be handy for when I spilled coffee grounds or sugar all over the floor--something I do often enough to justify a hand-held, cordless vacuum cleaner. 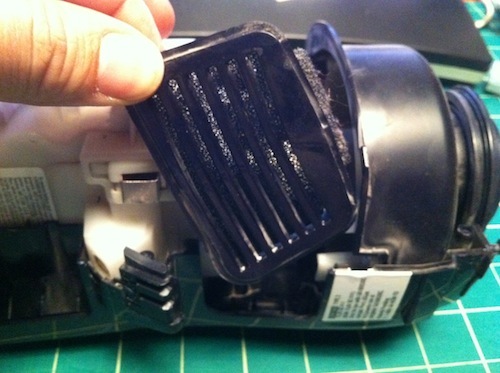 Like all DustBusters, this model came with a wall mount and a small charger so that device could be ready to go, always charged, at the first sign of a dust-bunny attack. My model came with NiCd batteries installed, as I assume all of them do. NiCds have a lot of advantages over other battery chemistries, including less internal resistance (so the can supply large currents), a lower self-discharge rate (last longer unused) and can stand deeper discharges. These types of batteries are also less expensive than lithium polymer or nickel-metal-hydride batteries so they are used in many devices to lower the cost of manufacturing. The big negative about NiCds, however, is that they suffer from a 'memory effect' where, in some circumstances, NiCds appear to only charge from the point of the last charge cycle. So, over time, they appear to have markedly less capacity. That is what happened to my DustBuster so that about after a year of owning it, I couldn't use it for more than a few minutes without it running out of power. I looked around for a replacement battery pack and discovered that you can't buy one. They sell replacement filters, nozzles and attachments but not battery packs. Rather than buy a new DustBuster, I decided to replace the internal batteries with NiMH (Nickel-Metal-Hydride) batteries which don't suffer from the memory effect and have at least twice as much charge density. has a great FAQ about different battery chemistries and how different types of charging styles affect the life of those batteries. , which factors in electrical inefficiencies, gives us around an 18-hour charge (which happens to be what Black & Decker recommends for the initial charge before using). I wanted greater capacity, but I also didn't want to use a different charger other than the one which came with the vacuum, and I didn't want to extend my charge time to 5 days. So, while I had my choice of battery capacity, I settled on 3300mAh NiMH cells. They would have extended capacity and wouldn't be damaged by a little over-charging after the initial 30-36 hours for the first charge. The DustBuster battery compartment has room for 13 1.2V sub-C sized cells, which is a standard size somewhere between a C and a AA. It's a popular cell used a lot for radio controlled models. I bought my original NiMH batteries from a website that is no longer in business. I have since bought a great set of replacement cells from Amazon. NOTE: I bought the cells with metal tabs attached to the positive and negative terminals because I knew they would make soldering much easier. Unless you have metal strips to attach the cells and are very good at soldering, I suggest you get your cells with tabs as well. A 40W (or higher) soldering iron. 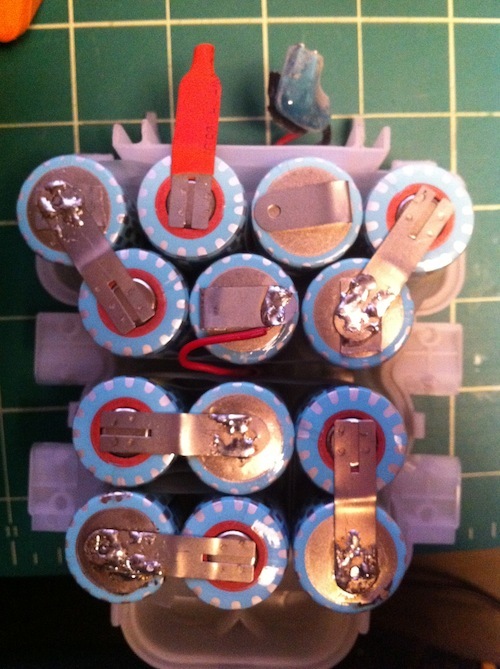 I found that using clear tape was helpful in holding the batteries together for soldering and grouping together in the final pack. You could use any thin tape like cellophane or masking tape. Disconnect and remove the battery pack. Solder together new cells to match the configuration of the original battery pack. Place the new cell in the battery pack housing and put everything back together. Here's the vacuum on its side, without the nozzle and filter set. There are 7 screws that hold it together. Keep in mind that the screw in the hanging hook is smaller than the other 6 screws. 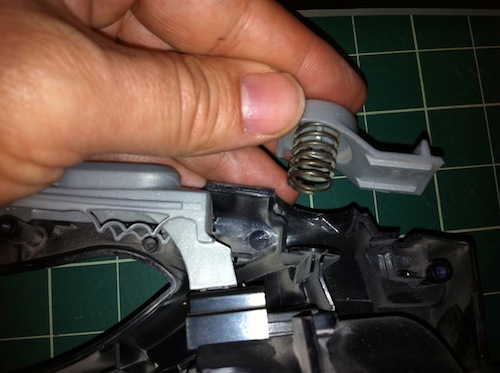 Remove all attachments and pull back the sticker in the attachments well. 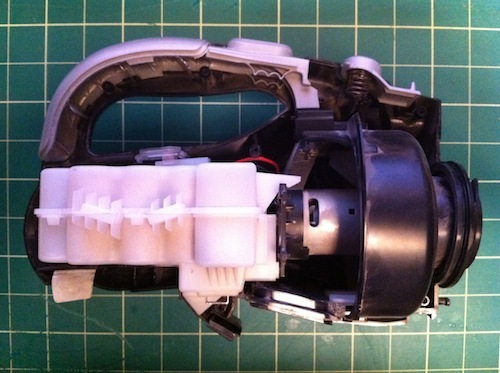 Here's what the vacuum looks like with one side removed. Now remove the filter underneath, the charging LED cover, the power switch, handle cover and nozzle latch. NOTE: Be careful when removing the power switch as you could turn on the vacuum and cut your hand and/or fingers. 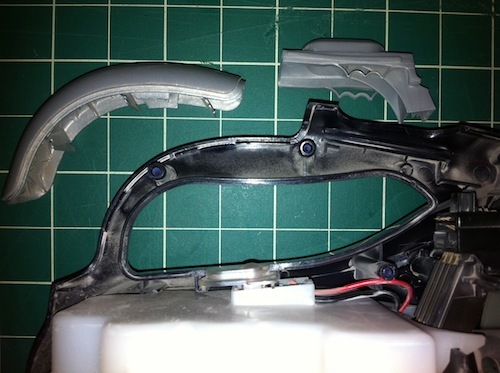 Next, remove the fan and motor housing along with the battery pack. I had to pull the front disc away from the fan housing with quite a bit of force to get this to work. 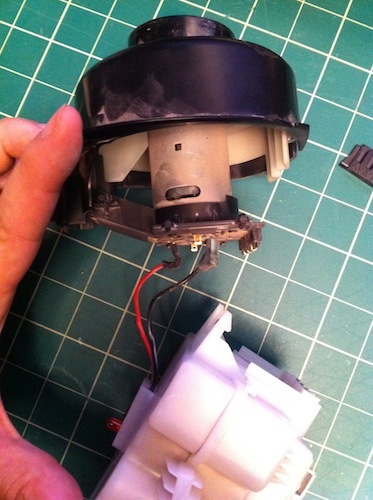 Here's the fan/motor housing and battery pack separated from the vaccum's outer casing. 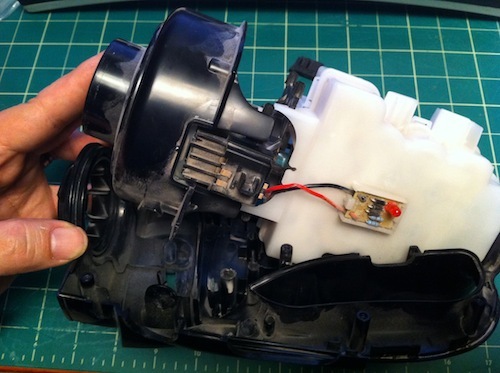 The white battery pack clips onto the motor and fan housing, forming one unit. 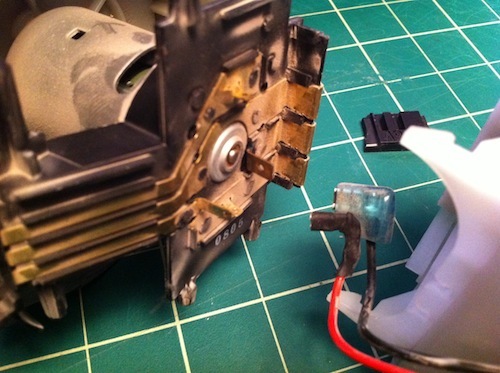 Unclip the motor/fan housing from the battery pack and disconnect the power cables from the motor. Positive and negative leads disconnected from the motor. Take apart the battery pack. 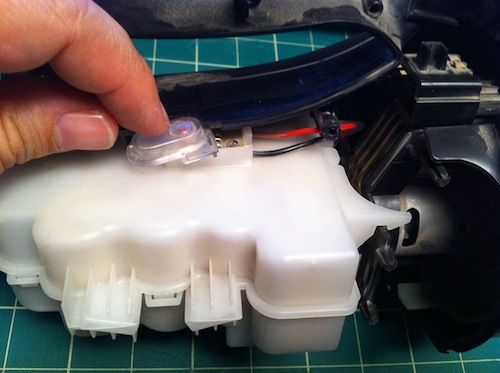 Open the battery pack, remove the batteries and cut the wires going to the positive and negative charging pads that are connected to the front two batteries. 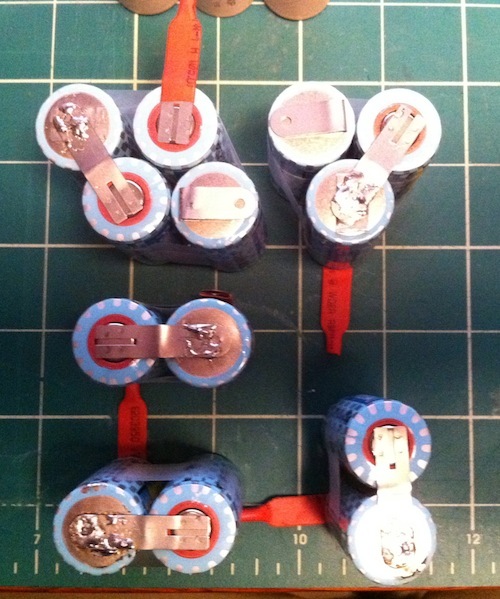 13 cells connected to form the original battery pack. This is the hardest part of the project, as you probably guessed. WARNING: Because these batteries have metal tabs, it's very easy to short-circuit them (touch negative to positive, closing a circuit). If you short-circuit the batteries you could burn yourself, cause a fire or possibly an explosion. 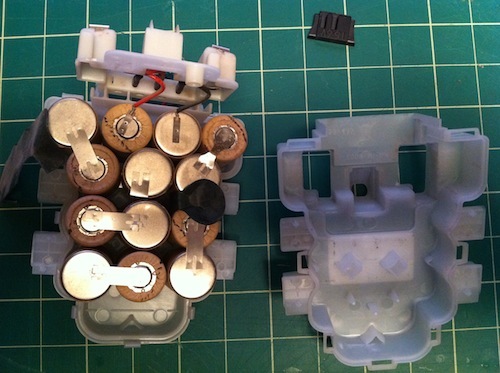 Be very careful when handling the batteries and think about where the metal tabs are going and what they're touching. 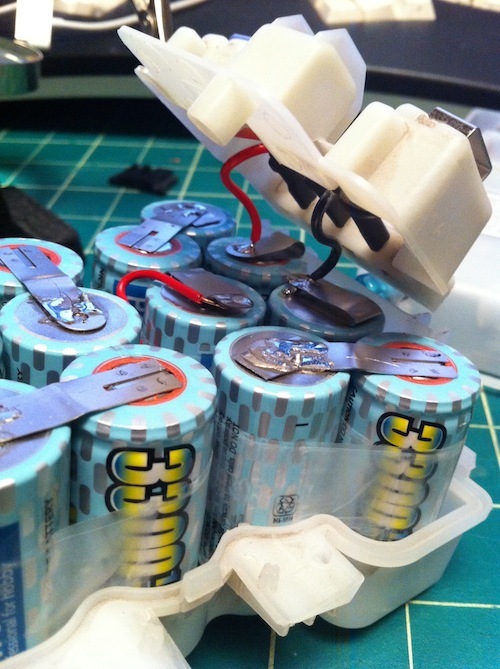 You'll notice that the battery pack is just a big chain of 13 batteries connected positive to negative back and forth ending with the two batteries at the top of the picture above. The charging connectors are attached to these two final batteries. The red lead goes to positive and the black to negative. 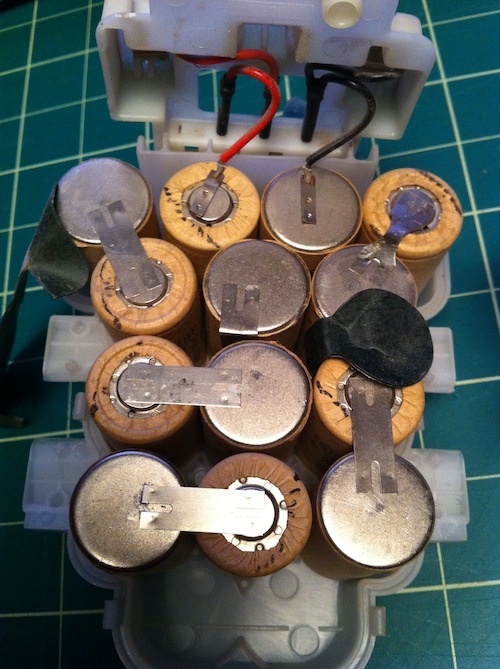 You will want to duplicate the back and forth nature of the battery pack with your own cells, using the tabs to solder the batteries together. I tried a few strategies, but the best for me was to cut the tabs on the negative side of the cells so that they were flush with the side of the battery, but leave the top tab (positive side) uncut. Here is the bottom of a cell showing how I cut the tab. Next to it is another cell showing the untouched insulated positive side tab. 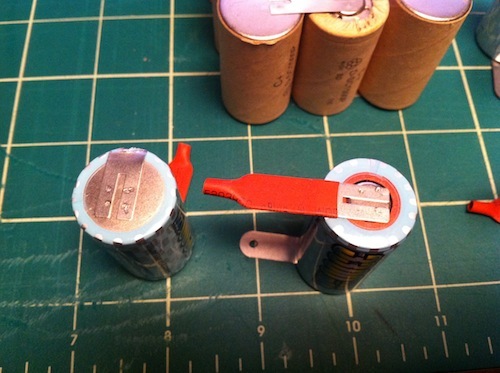 Soldering Tip: What worked best for me, after trial and error, was to place the batteries side by side so that the positive lead of one battery sat as flush as possible to the negative side of the battery I wanted to solder. Then I made as much contact with the soldering gun tip and the edge of the positive lead. When I thought it was hot enough to met the solder (around 5-10 seconds in my case) I touched the solder to the edge of the positive lead. What I wanted was to have the solder melt and slip underneath the positive tab, filling the space between the tab and the negative side of the battery with molten solder. 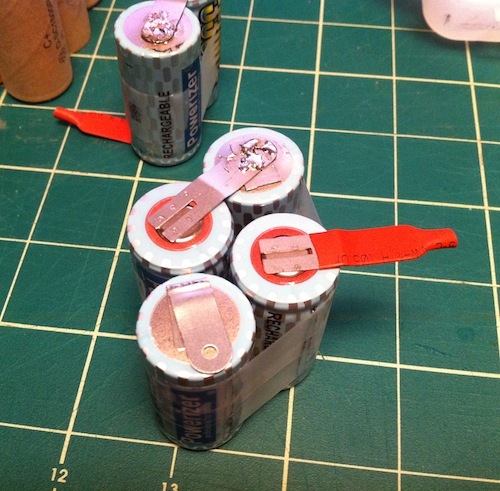 Build your battery pack by grouping batteries in 2, 3's and 4's using tape to secure them together. 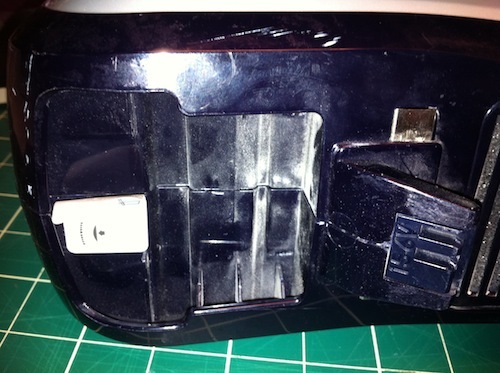 The tape will help you steady them while you solder. 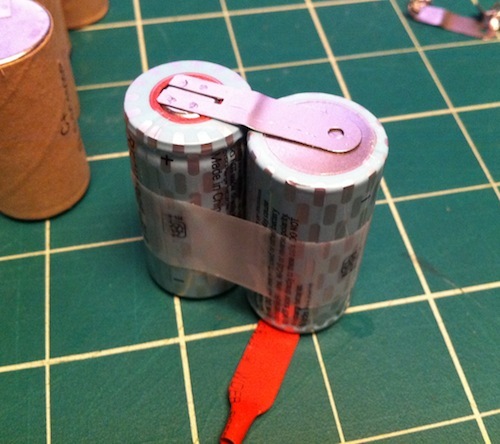 Plan ahead and lay out the groups of batteries to make sure they match the original battery pack. 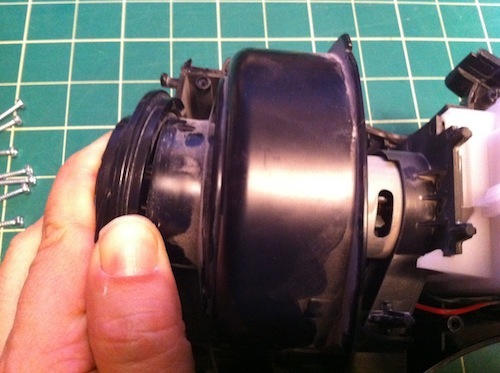 Do not remove the insulating sleeves on the positive terminals until you're ready to solder. REMEMBER: Be careful of short circuits. 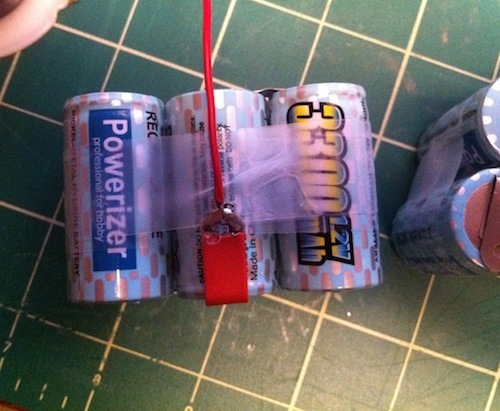 You will need to connect the two middle batteries using a piece of hookup wire. Notice that I trimmed away just a bit of the insulation to allow me to solder one end of the hookup wire. Almost done: Battery pack showing all batteries in place, including the connection between the two center batteries. Check the connections: During soldering and assembly, I used a multimeter to verify that my solders were good and that current was flowing between cells. 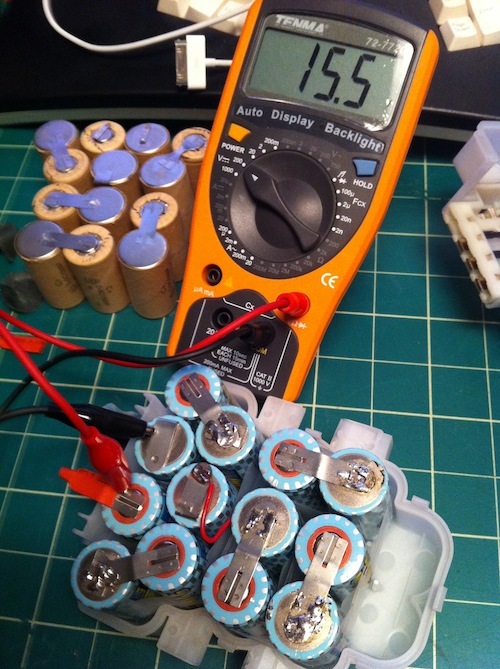 Here is my final check on the voltage of all 13 cells (13 x 1.2v = 15.6). Final soldering: Re-attach the charging plate leads to the last two unconnected batteries in the chain. Red wire goes to the positive battery tab and the black wire goes to the negative tab. Notice that rather than cut the tabs, I just folded them over to make soldering the final charging wires easier. It will take around 24 hours to fully charge the new NiMH cells. If you don't use your DustBuster very often, leave it plugged in for 24 hours every 4 weeks to top off the batteries. It's probably a good idea not to leave the cells charging all the time, as a trickle charge may damage the batteries.